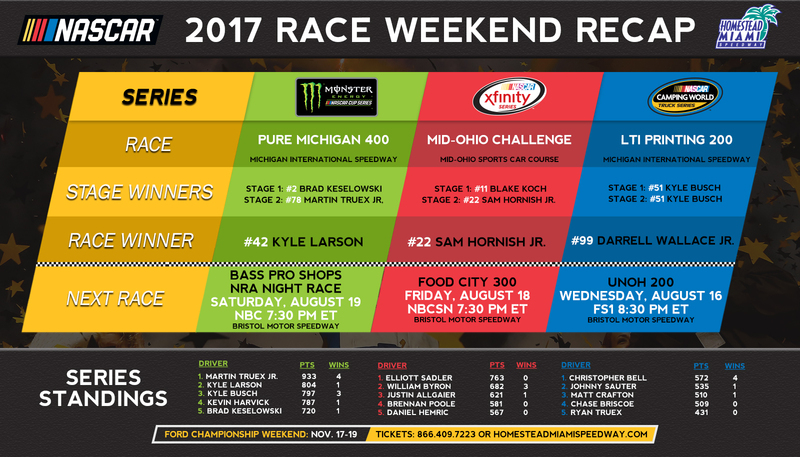 · Kyle Larson won the 28th annual Pure Michigan 400 Monster Energy NASCAR Cup Series (MENCS) race at Michigan International Speedway Sunday afternoon. It is Larson’s fourth win in 134 career MENCS races and his third this year. · Larson’s three wins are tied with Jimmie Johnson for the second-most on the circuit this year, trailing only Martin Truex Jr., who has had four wins. · For Larson, it was his 13th top10 finish in 23 races this year and his 10th in the top-5. · Dating back to the August 2016 race, Larson now has won three straight Cup races at Michigan, just the third driver to accomplish that feat, joining Hall of Famers David Pearson (3 from 1972-73) and Bill Elliott (4 from 1985-86). · Martin Truex Jr. (2nd) posted his 16th top-10 finish and 10th top-5 showing in 23 MENCS races this year. · Rookie Erik Jones (3rd) accounted for his best finish of the year and his Cup career. It was his eighth top-10 finish and second top-5 in 23 races this year. · Brad Keselowski won Stage 1 of the race, while Martin Truex Jr. won Stage 2, his series-high 15th stage win of the year. · Martin Truex Jr. (933) leads the 2017 point standings by 129 points over Kyle Larson (804). They are followed by Kyle Busch (797) and Kevin Harvick (787). · Thirteen drivers currently have qualified for the 16-driver field of the 2017 Monster Energy NASCAR Cup Series Playoffs. The list consists of Kurt Busch, Brad Keselowski, Martin Truex Jr., Ryan Newman, Kyle Larson, Jimmie Johnson, Ricky Stenhouse Jr., Austin Dillon, Ryan Blaney, Kevin Harvick, Denny Hamlin, Kasey Kahne and Kyle Busch, each of whom has won at least one race this season. The Playoffs culminate with the Ford EcoBoost 400 championship finale on November 19 at Homestead-Miami Speedway. · In four career MENCS starts at Homestead-Miami Speedway, Kyle Larson has had a pair of top-10 finishes, including a best of second in the 2016 Ford EcoBoost 400. · Sam Hornish Jr. won the 5th annual Mid-Ohio Challenge at the Mid-Ohio Sports Car Course in Lexington, Ohio Saturday afternoon. It is Hornish’s fifth win in 117 career XFINITY Series starts, and his first since June 19 of last year at Iowa. It also was Hornish’s first top-10 finish in three 2017 XFINITY starts. · Rookie Daniel Hemric finished second, his ninth top-10 finish in 21 XFINITY races this year and his top showing. · Matt Tifft (3rd) accounted for his fifth top-10 finish in 21 races this year, while he also posted a season-best showing. · With victories to their credit this year, William Byron (3), Justin Allgaier (1) and Ryan Reed (1) have clinched spots in the 12-driver playoff field in the 2017 NASCAR XFINITY Series Playoffs. The Playoffs culminate with the Ford EcoBoost 300 XFINITY Series championship race at Homestead-Miami Speedway on Saturday, November 18. · Elliott Sadler (763) leads the XFINITY Series points standings by 81 points over rookie William Byron (682). They are followed by Justin Allgaier (621). · Darrell Wallace Jr. won the 18th annual LTi Printing 200 NASCAR Camping World Truck Series race Saturday afternoon at Michigan International Speedway. In what was his first Camping World Truck Series start of the year, Wallace picked up his sixth victory in 45 career Camping World Truck Series starts. It was his first win in the series since he won the 2014 Ford EcoBoost 200 at Homestead-Miami Speedway. · This is the first win for truck owner Matthew Miller and MDM Motorsports in the Camping World Truck Series. · Christopher Bell (2nd) accounted for his 12th top-10 finish and ninth top-5 showing in 13 NCWTS races this year. · Kyle Busch (3rd) posted his fourth top-10 finish and third top-5 showing in six races this year. · Austin Cindric (5th) was the highest finishing rookie. · Christopher Bell (4 wins), John Hunter Nemechek (2 wins), rookie Kaz Grala (1 win), Johnny Sauter (1 win) and Matt Crafton (1 win) all have qualified for the 8-driver field in the 2017 NASCAR Camping World Truck Series Playoffs. The Playoffs culminate with the Ford EcoBoost 200 Camping World Truck Series championship race at Homestead-Miami Speedway on Friday, November 17. · Christopher Bell (572) leads the points standings by 37 points over Johnny Sauter (535). Two-time series champion Matt Crafton has compiled 510, while rookie Chase Briscoe has collected 509 points.